Join Transition Silicon Valley and World Centric for a special showing of a new film about agriculture in the Bay Area. Filmmaker Chuck Schultz will be present for a showing of his film, The Last Crop. This is his story of farmers Jeff and Annie Main, their Good Humus Farm and how they are planning to preserve it as a working, organic farm for future generations. After the film, Chuck will lead a discussion about issues farmers encounter in staying on the land and what we can help them do about them. Free Film Series – Food Connections! See how people around the country are working to revitalize the connection between the food we produce and the food we eat. From farms to urban food deserts to the kitchens of celebrated chefs, we’ll learn about the movement to put good food back on the table. Wildlife filmmaker Rebecca Hosking shows how she transformed her family’s farm in Devon into a low energy farm for the future, discovering that nature holds the key. Back by popular demand! In this fascinating film, famed permaculturist Geoff Lawton shows how to turn even the most unpromising ecosystems into thriving, productive food forests. Today, the average conventionally grown vegetable travels more than 1500 miles and is over-processed, stale, and without nutrition. Learn how the Locavore movement is changing all of that. It’s harvest season, and the autumnal equinox! Come to share food, conversation, and ideas. Provocative films, great discussion, and opportunities to connect with others who want to make a difference. Fresh fruits, vegetables and flowers covered table after table at the first Sunnyvale Local Garden Share hosted at Full Circle Farm last month. About 30 adults and children came to the event put together by the farm, environmental education nonprofit Acterra, Sunnyvale Cool, Transition Silicon Valley and Summerwinds Nursery. 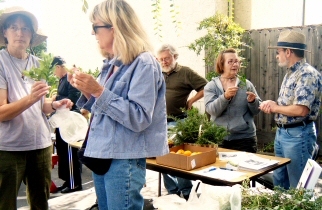 At the July 24 event, gardeners from Sunnyvale, Cupertino, Saratoga, Palo Alto and Santa Clara shared everything from apples, blueberries, plums, oranges and apricots to green beans, zucchini, herbs, peppers, tomatoes, flowers and even bread makers. “The intent of the garden share is to build community by sharing the excess from our gardens, getting to know each other and offering ideas and suggestions about edible growing,” Full Circle Farm volunteer Michelle Philips said. Today’s post is from a guest blogger, Maria Mesa of cookorgasmic.com—a blog about food-related activities, especially enjoying food. She is an active member of Transition Palo Alto and enjoys reading comments and suggestions from readers. The National Geographic of January 2011 published an article that estimates a total of 9 billion people for the year 2043. This article got me thinking about the magnitude of the challenge that we will be facing very soon: the need to feed a global population of nine billion with a diminishing supply of cheap fuels available to fertilize, plow, and irrigate fields and to harvest and transport crops. Optimistic estimates of peak oil production forecast the global decline will begin by 2020 or later, and assume major investments in alternatives will occur before a crisis, without requiring major changes in the lifestyle of heavily oil-consuming nations. Pessimistic predictions of future oil production believe that a proactive mitigation may no longer be an option; a global depression is predicted, perhaps even initiating a chain reaction of the various feedback mechanisms in the global market that might stimulate a collapse of global industrial civilization, potentially leading to large population declines within a short period. Almost two centuries ago Jean Anthelme Brillat-Savarin stated that the destiny of nations depends on the manner in which they are fed. The removal of fossil fuels from the food system is inevitable. Only the amount of time available for the transition process, and the strategies for pursuing it should be matters for debate. The end of the cheap fossil fuel era must be reflected in a change of diet and consumption patterns among the general population, with a preference for food that is locally grown, that is in season, and that is less processed. A shift away from energy-intensive, meat centered diets should be encouraged. Rob Hopkins, in The Transition Handbook: from oil dependency to local resilience, does not give an exact set of solutions to face peak oil production and climate change, since he believes that what works in one place will not necessarily work in other places; however, he does believe that localizing is the broad answer: stronger local economies, increased local democracy, strengthened local food culture and a more local energy provision. After reading Hopkins’ handbook, I decided to try to imagine how people would eat in the future, and I decided to pick the year when the world’s population would include 2 billion more people and when even the most optimistic estimates of peak oil production predict major changes in the lifestyle of heavily oil-consuming nations. For the purpose of this exercise I will imagine the life of a fictional lawyer in the year 2043, John Doe, who lives and works in Silicon Valley. When John Doe is not in the courts dealing with the usual family and criminal litigation, he is occupied growing food at the town’s farm. After the U.S. government finally rationed energy, when the oil prices became prohibitive for fossil-fuel-based agriculture, Silicon Valley organized into small towns or no more than 5,000 people. These local communities rely on biointensiveagriculture, and most include industrial plants and high-tech enterprises. Food became a central activity in the lives of people since the cost of food started to use up at least 50% of the typical budget, and people’s only alternative became to participate directly in producing and processing food in the town’s many new farms. Even lawyers and other specialists could no longer command unusually large incomes, so they too worked in food production. John Doe works on a local farm for two hours before having breakfast in the communal dining hall at 8 AM. Parents eat with their children in the communal dining halls of their children’s schools. The food offered in these dining halls is mostly produced in the town’s farms, with a small portion coming from each school’s edible garden. Children work in school kitchens, where they experience culture, history, language, ecology, and mathematics through the preparation of food. John Doe goes back to the farm from 9 AM to 11 AM. John has discovered the pleasures of working with the land, and he is experiencing the satisfaction of harvesting his food and seeing it end up in his plate, he is also rediscovering the superior taste of local and organic produce. Lunch is served (also in the communal dining hall) at 11 AM. After lunch John Doe litigates in the town’s courthouse until late evening, and then John returns to his house and participates in the preparation of food with the people that live in his lot. The menu is seasonal, mostly based in grains, vegetables and fruits, but lamb, chickens, rabbits, and other small farm animals that feed mostly from grasslands are occasionally part of the diet as well as the fish caught in the Pacific Ocean. Main courses in the communal dining hall menu include grilled sardines, chicken al Mattone, fried rabbit, braised grass-fed goat, fish and shellfish in broth, spit-roasted pork loin, sautéed black cod, spit-roasted guinea hen, spot prawns, rack and loin of lamb. The dramatic changes in the food landscape in America triggered the most remarkable improvements in health in the United States, in which diet-related diseases had been the biggest killer, two-thirds of Americans were overweight or obese, and children had a shorter life span then their own parents. Americans came out of the limbo of gastronomy where they were, and in the year 2043 they know how food arrives at their table. They understand that food is almost as important as language; it provides a sense of identity to a nation even more so than language. The alphabet for food is the produce, the grammar is the recipes, the syntax is the menu and the rhetoric is the conviviality. The way Americans will eat in the year 2043 will depend on the willingness of the Americans of the year 2011 to learn food’s language or to stay in the limbo of gastronomy. On Saturday, May 14th, volunteers and community members in East Palo Alto will come together to deliver and install up to ten backyard gardens for eager beginning gardeners. Many of these gardeners have completed a twelve week course of cooking, nutrition, and gardening with Collective Roots, and are excited to launch new lifestyles full of healthier, more environmentally sustainable, home-grown food. Come help install raised beds and plant spring gardens to make these new lifestyles a reality! To register for this event, or if you have any questions, please e-mail: nicole at collectiveroots dot org.